The sewer pipeline running underground at your residential, commercial, or industrial property may very well be a ticking time bomb. It is susceptible to a host of problems that are caused by shifts in the earth, the invasion of tree roots, and normal wear and tear due to age to name a few. These normally occurring situations tend to cause the pipes to break, crack, and clog. The question that remains is how can you tell if there is a problem with your sewer system? There are some obvious signs. For example, if the raw sewage and wastewater back up into the property through the toilets, faucets, and or drains than you know that something is terribly wrong. If puddles are forming in the yard, on the grounds, or in the parking lot and it has not rained in a while than chances are it is due to an issue with the sewer system. However, problems with the sewer system begin long before they become obvious. The good news is that these minor issues can be repaired before they turn into a major catastrophe. That being said there is only one way to know exactly what is going on underground in the sewer system at your property. Sewer camera inspection in Oklahoma City, OK certainly is a key piece of the preventative property maintenance puzzle. When regularly performed by a professional plumbing contractor, like Nu Flow Technologies it will significantly lessen the likelihood of a complete and total sewer system failure. Thanks to advances in video technology the process is extremely effective, completely non-invasive, and easily affordable. It is a worthwhile piece of preventative maintenance investment that may save you thousand of dollars, and countless headaches down the road. 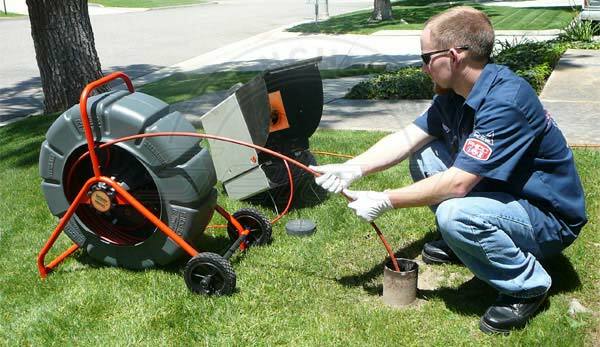 Simply contact Nu Flow and we will send out an experienced sewer camera inspection technician and has been trained in all of the latest technologies. He or she will insert a tiny waterproof camera that is attached to the end of a flexible rod into the sewer pipeline. As the rod is fed through the system it records crystal clear video images of the interior of the sewer pipeline. The video is broadcast live to the technician’s laptop computer, tablet, or smartphone, enabling them to determine the exact condition of the sewer pipeline on the spot. Obviously the hope is for a clean bill of health, however the technician will often discover minor issues. Most of the time these minor issues do not require immediate attention, however they must be kept track of with yearly sewer camera inspections. If the technician does happen to discover a more serious problem than it can be fixed immediately in order to avoid a major disaster, such as raw sewage and wastewater flooding into your property. Nu Flow Technologies is proud to offer the most technologically advanced sewer camera inspection services in the Oklahoma City, OK area. Our company has been in business since 1998, and we will be here for you well into the future. Please contact us at your earliest convenience.